St. Peter’s Sunday school has classes for children ages pre-K through high school. We currently have four classrooms: pre-K–1, 2–4, middle school, and high school. Our staff consists of 11 volunteer teachers who are Safe Church trained, with one serving as the Sunday School Coordinator. We have about 24 active students following the David C. Cook curriculum. 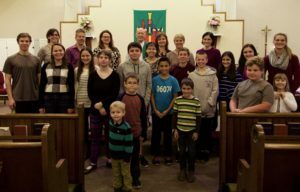 Our Sunday school classes meet during the first part of the 10:00 church service and the students then join the church service in time for communion. Our students enjoy a fun and safe learning environment.